Having to plant susceptible corn hybrids alongside Bt corn has always irritated some growers. Although planting non-Bt refuge is the only form of resistance management for Bt corn technology, compliance with refuge requirements has slipped severely. This could be setting the scene for the development of insect resistance to the Bt toxins, and the subsequent loss of Bt corn technology. 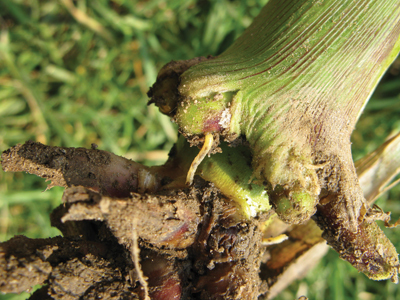 Research is ongoing in the United States to determine if corn rootworm is developing resistance to Bt corn. Photos courtesy of Jocelyn Smith, OMAFRA. This possibility is not far-fetched. 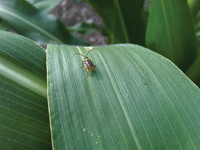 “Performance issues” have been noted recently for corn with Bt traits for corn rootworm (CRW) in the United States, says Ridgetown entomologist Jocelyn Smith. Smith spoke of this scenario during the July 2010 Southwest Crop Diagnostic Day held at the University of Guelph’s Ridgetown campus. These issues involved severe root lodging of Bt corn while adjacent non-Bt corn remained standing. 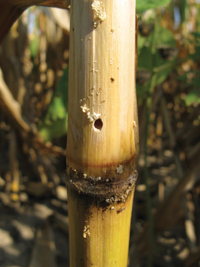 Smith says that although such performance issues have not been observed yet in Canada, they have been reported for all CRW Bt traits and in several states, including Iowa, Illinois, Minnesota, Nebraska, South Dakota and Wisconsin. It is not known yet whether the problems are related to resistance or other factors. Still, the implications are not good, particularly considering the state of resistance management in Canada. While the corn acreage planted to Bt hybrids in Canada has climbed, compliance with refuge requirements has dropped. According to a biennial survey commissioned by the Bt technology providers and released through the Canadian Corn Pest Coalition (CCPC), the amount of Bt corn planted increased from 45 percent of total corn acreage in 2005 to 74 percent in 2009. During that same time span, however, refuge compliance decreased from 80 to 61 percent of growers. Despite the 61 percent compliance, more than 90 percent of growers stated that they were aware of the mandatory refuge requirements. Some growers followed the requirements incorrectly, whereas others simply ignored them. The Canadian Food Inspection Agency (CFIA) assesses plants with novel traits such as Bt for their potential to become problematic, before authorizing their use, says CFIA plant biosafety policy specialist Nataliya Dormann, who joined Smith at the crop diagnostic day at the Ridgetown campus. Plants with Bt traits are regulated because insect pests could develop resistance to the Bt toxins, creating an obstacle to pest control, she explained. So, the Bt technology is available to growers only on the condition that they plant refuge to reduce this risk. Because so many growers are not following the refuge requirements, the CFIA has asked the Bt corn technology developers, who are responsible for maintaining compliance, to generate a corrective action plan. “We’ve received that corrective action plan and we’re currently in the final stages of reviewing it,” says Krista Thomas, CFIA national manager for plant biosafety. The plan will be implemented during the next two years and will intensify both verification of refuge use and follow-up visits with non-compliant growers, she says. The proposed plan focuses on three areas of improvement, says Janice Tranberg, acting executive director of biotechnology for CropLife Canada, the trade association representing the developers, manufacturers, and distributors of pest control products and plant biotechnology, which developed and submitted the plan to the CFIA. First, the survey indicates that growers consider seed dealers one of their top sources of information on insect resistance management, so the industry has developed a guide to ensure that seed dealers are providing consistent and correct information to growers. Second in the proposal is a set of performance standards that the industry will use to make sure that it is adhering to the action plan, says Tranberg. Current refuge requirements involve both the amount and proximity of refuge. A minimum of 20 percent of corn acres must be non-Bt hybrids of similar agronomics and planted at the same time as the Bt corn. Bt and non-Bt seed must not be blended together. The proximity of the refuge depends on whether the transgenic corn has traits for CRW or European corn borer (ECB). For CRW traits, the refuge must be within or directly adjacent to the Bt field. For ECB traits, the refuge must be located less than 400 metres (a quarter of a mile) from the Bt field. “Refuge-in-a-bag” might be effective for European corn borer because it is thought that the larvae complete their development on a single plant. These differences in the proximity of refuge and Bt cornfields are related to the strength of the traits and the insects’ life cycles, Smith explains. The Bt traits for ECB are high dose, meaning that they kill more than 99 percent of ECB that are exposed to the Bt toxins by consuming the plant tissue, she says. Additionally, ECB moths may move up to 400 metres from where they emerge, congregating in grassy ditches and headlands to mate, and then moving into nearby cornfields to lay eggs. This means that any resistant individuals will have a good probability of mating with non-resistant individuals from nearby refuge. The “refuge-in-a-bag” concept, in which Bt and non-Bt seed is blended, might work for ECB because it is thought that the larvae tend to develop on a single plant, says Smith. So individuals on refuge plants would have low risk of exposure to Bt, and therefore death, before mating and passing on their susceptible genes. In contrast, the Bt traits for CRW are low to moderate dose, with possibly up to five percent of individuals surviving exposure. In absolute numbers, CRW is much more abundant than ECB, resulting in much larger numbers surviving. Also, adult CRW do not move far before mating and tend to mate with individuals from the same field, so refuge needs to be in closer proximity than for ECB. It would seem, then, that refuge-in-a-bag would be very suitable for CRW. However, because the larvae are quite active and can move from plant to plant in the soil (up to one metre), they are at high risk of feeding on both Bt and non-Bt plants, potentially creating greater selection pressure for resistance, explains Smith. Refuge-in-a-bag has not yet been approved for Canada, although it would be a great way to ensure compliance, says Dormann. Whether it is approved in the future, and for which traits, depends on the risk of resistance development compared to the use of current methods, she says. Experiments evaluating refuge-in-a-bag are ongoing in the US. The only change to refuge requirements this year is for growers who plant Smartstax corn. Because this product contains several high-dose Bt traits for ECB, the amount of refuge required has been reduced to five percent of total Smartstax corn acres. However, Smith questions the efficacy of this in minimizing CRW resistance; although Smartstax contains two Bt traits for CRW, both are still low to moderate dose. Growers can check with the Canadian Corn Pest Coalition website or handbook (www.cornpest.ca ), their seed dealer, or provincial extension personnel for complete refuge requirements. Could corn fix its own nitrogen?